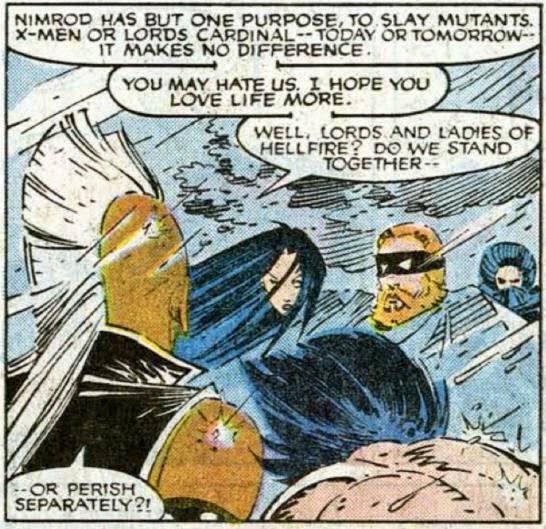 The X-Men and the Hellfire Club team-up against Nimrod. 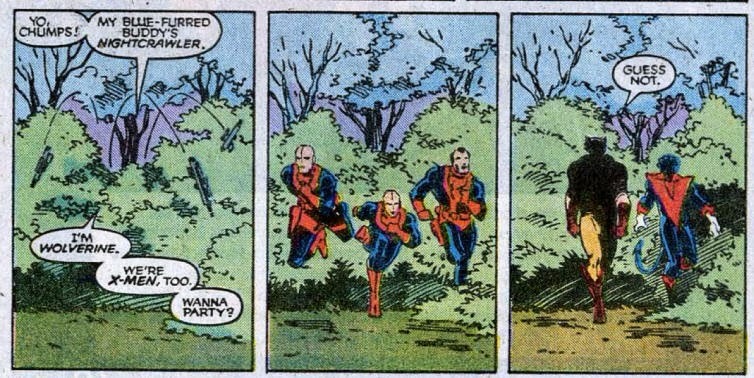 In Central Park, a three way battle erupts between the X-Men, the Hellfire Club and Nimrod. 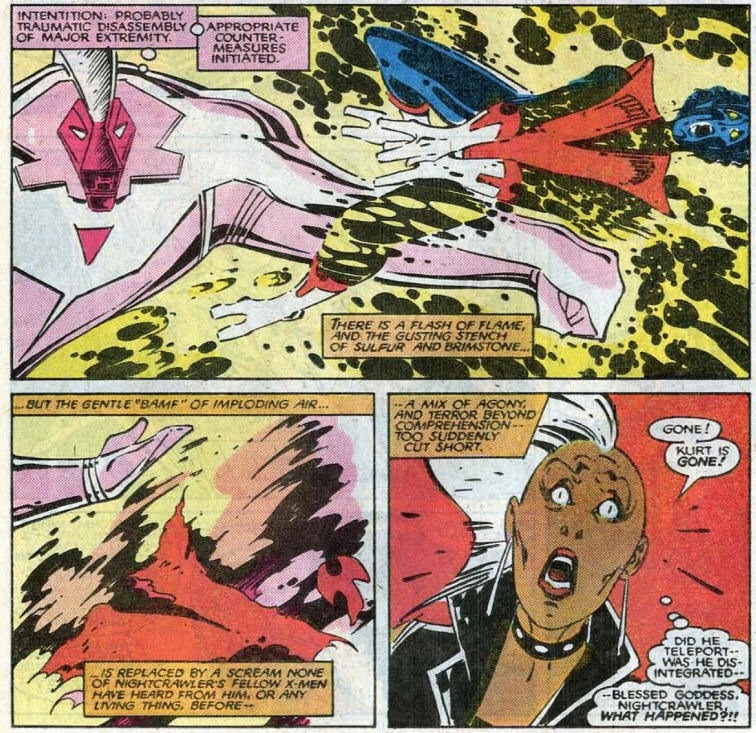 After Nimrod blasts Shaw into orbit and incerates Von Roehm, Storm proposes a temporary alliance between the X-Men and the Hellfire Club in the face of Nimrod's power, and Tessa agrees. Elsewhere in the park, Rachel debates joining the fray, despite her injuries, when she's distracted by music and led to the Body Shoppe, whose mysterious proprietress offers to heal and remake her. Across the park, Storm has Leland use his power to increase Nimrod's mass and lower him to the ground. Seeing an opening, Nightcrawler attempts to teleport a piece of the robot, despite Storm's warning that Nimrod has likely learned to block that attack. Instead of harming Nimrod, Nightcrawler howls in pain, then disappears. Just as Leland manages to get Nimrod to the ground, he collapses, suffering a heart attack. Colossus and Shadowcat, working together, manage to damage Nimrod further, allowing Selene to use the cables and rocks in the ground to bind him into place. With the last of his fading strength, the dying Leland retrieves Shaw and sends him hurtling back to Earth. With the force of a small meteorite, Shaw slams into Nimrod, shattering the robot. 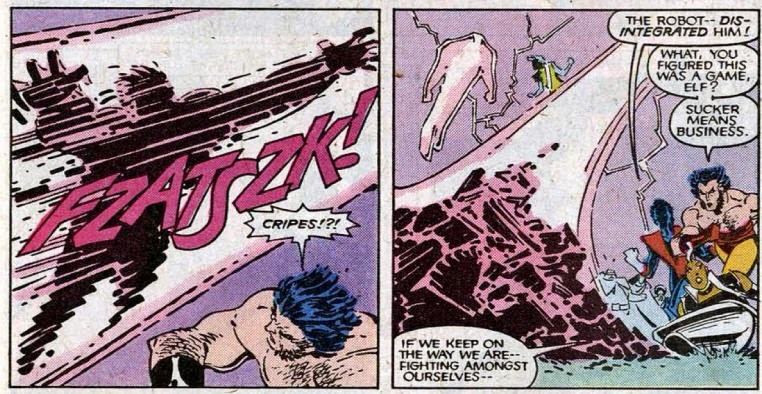 But as Wolverine steps up to further dismember the pieces, the remains of Nimrod teleport away. As the police arrive, Tessa extends the alliance further, offering the X-Men sanctuary at the Hellfire Club. Elsewhere, Rachel realizes her time with the X-Men is done, and enters the Body Shoppe, much to the delight of its owner, a disguised Spiral. Rachel leaves the X-Men as of this issue, lured by a disguised Spiral into her Body Shoppe with promises of being healed and given a new life. 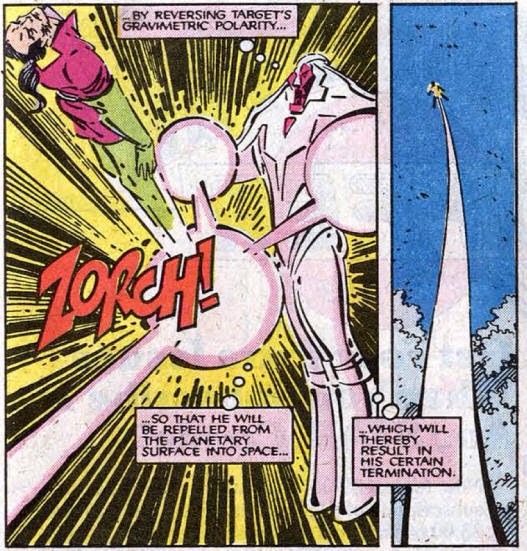 However much Rachel's absence may have been necessary for future stories, her departure is most directly a setup for a Phoenix limited series, intended to be written by Claremont and drawn by Rick Leonardi. It would have picked up where this issue left off, depicting Rachel's adventures in the Mojoverse, but ultimately never saw print. 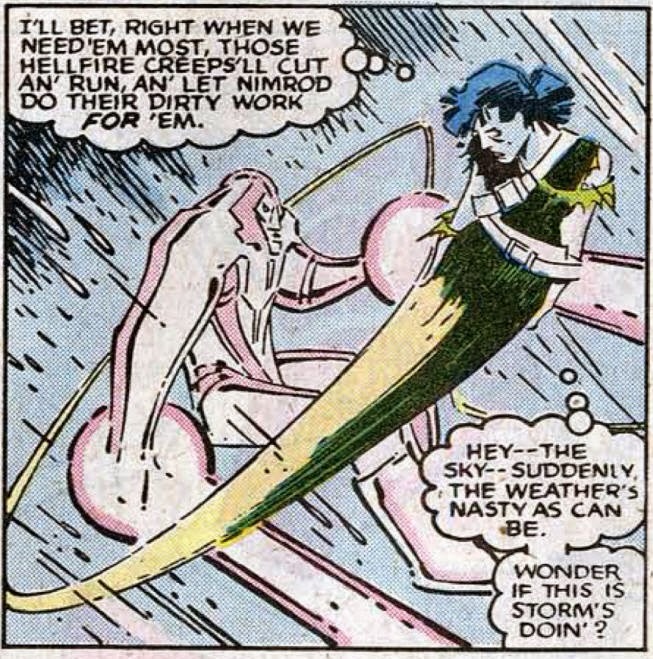 We'll next see Rachel escaping from the Mojoverse in the one shot that launches Excalibur. The X-Men make a temporary alliance with the Hellfire Club in this issue; the alliance will, in future issues, be formalized and solidified, with Magneto joining the club as the White King. 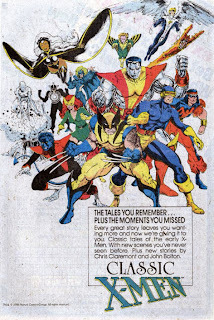 Ultimately though, while the alliance will feature in some future New Mutants stories, it won't amount to a whole lot and will be largely swept under the rug as Claremont leaves the book and the Inner Circle is wiped out by the Upstarts. 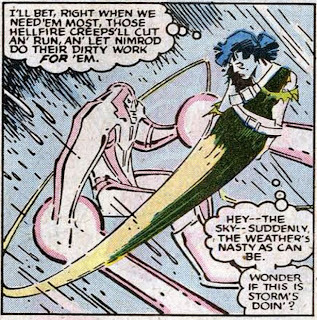 Nightcrawler, attempting to repeat Rogue's previous trick from issue #194 of teleporting a piece of Nimrod, gets severely injured and disappears in the process. His disappearance will feature in the next issue, while the injuries sustained here will play a role in "Mutant Massacre" and his eventual departure from the team. The Hellfire Club gets dealt some significant losses in this issue, as Harry Leland suffers a heart attack while fighting Nimrod and dies, while, to a much lesser extent, Friedriche Von Roehm is incinerated by the robot in the course of the battle. Despite all the setup with Nimrod posing as a human, living with the Rodriguez family and becoming a local hero, this issue essentially serves as the swan song to his story, at least as written by Claremont. He'll next appear in issues #246 and #247, in which this iteration of the character is effectively destroyed. Rogue mentions encountering Sebastian Shaw prior to joining the X-Men; this encounter is, as of yet, unpublished, intended to appear in later issues of the Claremont-penned Ms. Marvel before that title was cancelled. For anyone who didn't get the reference, a thought bubble from Selene establishes that Nimrod is named after the legendary hunter. 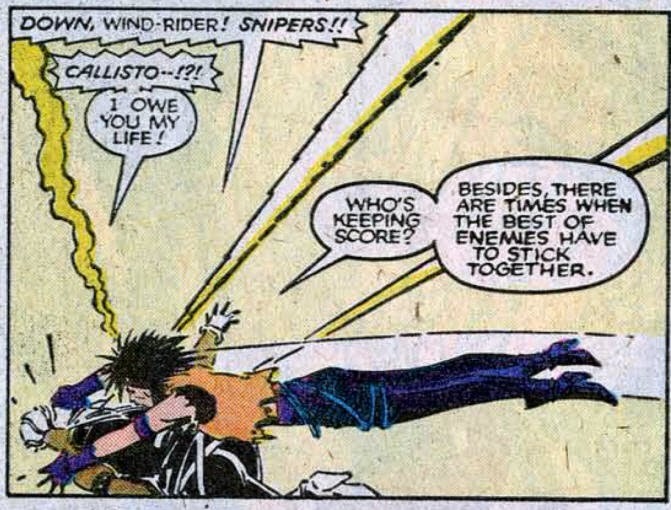 Callisto saves Storm, her comment while doing so foreshadowing the upcoming alliance with the Hellfire Club. As further proof of Nimrod's status as the ultimate Sentinel, he thinks about his battle strategies, rather than declaring them out loud. Once again, the idea of Storm having somehow retained or regained some measure of her power is teased, but it ultimately leads nowhere. 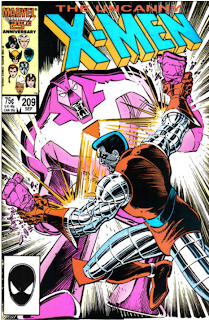 In a play on a similar tactic they used in issue #202, here Shadowcat phases herself inside Colossus, masking her from Nimrod's sensors, then phases into Nimrod, disrupting his systems and leaving him vulnerable to Colossus' attack. 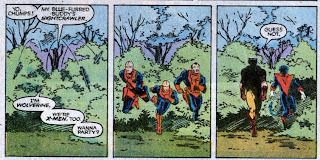 In a humorous little sequence, Wolverine and Nightcrawler essentially scare a group of Hellfire Club soldiers into running off. I've never heard of the A.I. 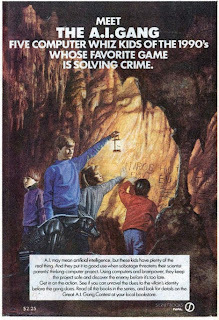 Gang before, but it sounds pretty awesome. Classic X-Men, the first issue of which was on sale at the same time as this issue, receives a full page house ad. The action packed finale to the three part Hellfire Club/Nimrod arc, this is another Classic Claremont Action comic, masterfully paced, permeated with a genuine sense of "how are they going to get out of this? ", and filled with clever bits of fight choreography, like Nimrod getting held in place via Con Ed cables while Shaw is turned into a living meteorite and sent careening down into the robot. In that regard, this is one of the more straight-forwardly comic book-y issues of the soon-to-end Claremont/Romita Jr. run. But there's a further wrinkle to the issue that adds an interesting juxtaposition to the traditional action sequences that speaks to the darker thematic elements of their run as well. 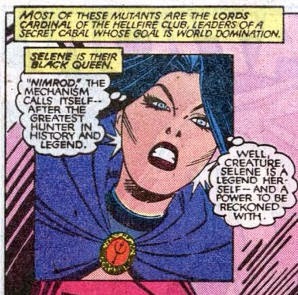 In the course of their battle with Nimrod, Storm proposes an alliance of necessity with the Hellfire Club, in order that both groups survive in the face of Nimrod's power. Starting next issue, we'll see that alliance extended in the name of that which Nimrod represents: humanity's fear and hatred towards mutants. 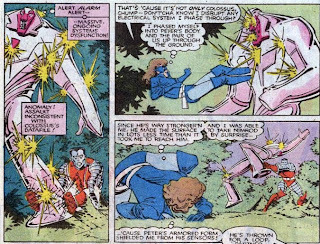 Earlier in their run, with the formation of Freedom Force, Claremont and Romita Jr. had repositioned the X-Men so that they were firmly on the wrong side of the law (even while their actions were still ultimately good). Now, in the face of an establishment that is growing increasingly hostile towards mutants, represented by the mutant-hunting Nimrod, they're forced into a partnership with those who were once their greatest foes, responsible in part for perpetuating the greatest tragedy the X-Men had ever faced. The world of the X-Men is no longer black-or-white: federal agents can be villains, villains can be allies. That this is set in contrast to one of the book's more traditional and viscerally-satisfying sequences of comic book action makes it, and this issue, all the more striking. Tomorrow, the New Mutants battle Legion in New Mutants #44, and Friday, X-Factor battles Freedom Force in X-Factor #8. Next week, the team searches for Nightcrawler and Phoenix in the prelude to "Mutant Massacre" in Uncanny X-Men #210. It amazes me that I can dislike a character as strongly as I do Rachel in Uncanny, and then like her when she reappears in Excalibur. Claremont makes some major adjustments to her characterization when he brings her back, and the new, more confident Rachel is actually pretty fun to read about. "...her departure is most directly a setup for a Phoenix limited series, intended to be written by Claremont and drawn by Rick Leonardi." I believe the first few pages were drawn, right? I think I saw them on Comic Book Legends Revealed, or maybe Marvel Comics of the 1980s. I believe the Fantastic Four were involved. "Rogue mentions encountering Sebastian Shaw prior to joining the X-Men; this encounter is, as of yet, unpublished..."
I wonder when Claremont was planning to let go of those unpublished Ms. Marvel issues. This is years after the series ended, and he's still acting like they either happened, or were going to happen. "With the last of his fading strength, the dying Leland retrieves Shaw and sends him hurtling back to Earth. With the force of a small meteorite"
I'm no physicist but I feel like that would have done more damage than just to Nimrod. "The X-Men make a temporary alliance with the Hellfire Club in this issue"
So, the X-Men have an alliance with Hellfire Club, known killers who have a member who literally survives by killing people. I can't say that sits right with me no matter how bad the anti-mutant sentiment gets. It also makes Wolverine look like even more a fraud. Ms. Marvel #24 and #25 were eventually published in Marvel Super-Heroes #10 & #11 in 1992. What was supposed to be Rogue's first appearance was in #11. The Hellfire Club also appear in that story. If Rogue met Shaw anywhere "on camera", it would have been there. So, is it safe to assume you'll be covering Excalibur as well? This is a fantastic issue all around. One of Claremont's biggest talents as a writer is framing a big action scene so that everybody has stuff to do and everything is interesting to watch. Sort of an anti-X-Men 3. This is also probably the closest to cool Harry Leland's character has ever been. I mentioned awhile ago that Nightcrawler was developing the "grab a part and teleport" as a sort of wrestling move, introduced issues earlier, and here's the pay-off, where it gets countered and Nightcrawler gets blasted as a result. Things are obviously getting dark around this point. It's a shame Cyclops is too busy abandoning his wife and pretending to be a ghostbuster to show up as a commentary on how much the team's changed just since his fight for leadership less than a year ago. Oh, and Ms. Marvel #24 and 25 were also published in the Essential Ms. Marvel volume before the Avengers Annual, so reading those issues for the first time, I definitely didn't realize there was an over 10 year publication gap between them. Yeah, I knew those two Ms. Marvel issues saw print eventually, though it was after Claremont had left Marvel. I just think it's funny that he kept referencing them, as if his wishful thinking would somehow get the book un-canceled, even years later. I credit this issue (one of the last I got via Classic X-Men before either the title was cancelled or my subscription ended, can't remember which) and the Classic X-Men backup about the Hellfire Club's origins that makes me weirdly fascinated with Harry Leland. He uses his last moments to do something noble, he's the only one that really mourns Lourdes & feels guilty for not helping her in the backup - I always wondered if, had we seen more of him, he would have turned out to be one of the more noble Inner Circle members. But that's just me being weird. I latch on to odd characters. @Matt: I believe the first few pages were drawn, right? I think so. Though I don't believe I've ever seen them. This is years after the series ended, and he's still acting like they either happened, or were going to happen. I may have said this before, but I honestly wonder if, at this point, Claremont has simply forgotten they weren't published. He obviously had them plotted in some detail (rather than vague notions of what would happen), and may have even scripted them before the series was cancelled (especially since the first issue of his planned Ms. Marvel/Rogue/Hellfire Club story more or less got completed before cancellation, since it ended up getting printed in Marvel Super Heroes years later). It wouldn't surprise me if, in his memory, they'd been published and were fair game for referencing. @Dr. Bitz: I'm no physicist but I feel like that would have done more damage than just to Nimrod. Yeah, Shaw obviously gets an out because of his power, and there is a pretty big explosion/crater generated as a result, but I have no idea how accurate/realistic that level of destruction is. It also makes Wolverine look like even more a fraud. Right? It's one thing to call off fighting those guys so they can both fight the thing trying to kill them together, but once the alliance is cemented further, it's like, "you're really just okay with Selene killing people now, aren't you?" @ShadZ: If Rogue met Shaw anywhere "on camera", it would have been there. I've only ever skimmed those issues, but I don't think she interacts with Shaw in them. Of course, she could have done so "between panels", so to speak, which make them a better reference than a totally unpublished issue. @Spithead: So, is it safe to assume you'll be covering Excalibur as well? In some capacity, yes. I might change it up a bit, since I've never actually read the first 70 issues of it (as opposed to almost all of this stuff, which I have read multiple times). Then again, I may not. But it will covered (ditto at least the first volume of Wolverine's solo series). @Dobson: One of Claremont's biggest talents as a writer is framing a big action scene so that everybody has stuff to do and everything is interesting to watch. Sort of an anti-X-Men 3. Ha! And agreed. Ditto on Leland as well. Nightcrawler was developing the "grab a part and teleport" as a sort of wrestling move, introduced issues earlier, and here's the pay-off, where it gets countered and Nightcrawler gets blasted as a result. I love that. Such a great little bit of subtle continuity. I don't think it's that weird. Claremont especially is really good at making relatively minor characters feel fleshed out and realized. Like you, I have a great deal of affection for Leland as a character just from this issue. "Despite all the setup with Nimrod posing as a human, living with the Rodriguez family and becoming a local hero, this issue essentially serves as the swan song to his story, at least as written by Claremont. He'll next appear in issues #246 and #247, in which this iteration of the character is effectively destroyed." I'd argue that 246 and 247 are the swan song. They do provide a payoff (and a good one, I think), to the "Nimrod is becoming more human" arc. @Jason: I'd argue that 246 and 247 are the swan song. They do provide a payoff (and a good one, I think), to the "Nimrod is becoming more human" arc. You're probably right. I tend to think of it as a Master Mold story first, one that Nimrod just kinda gets thrown into, so I sometimes forget how involved he is in it. 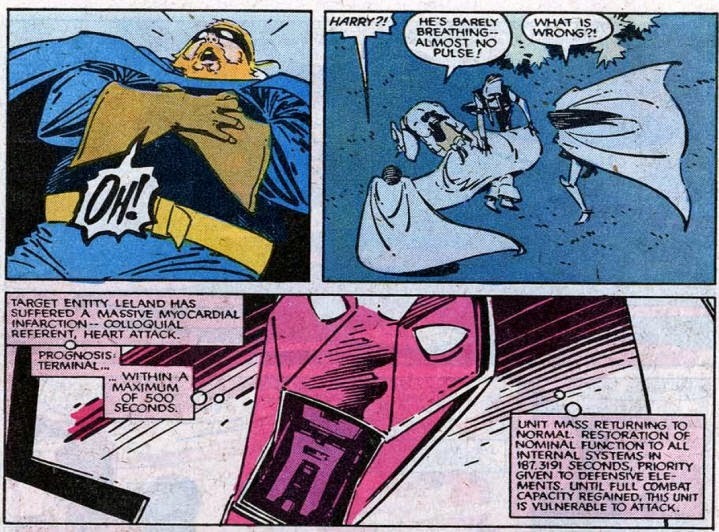 Kurt's failed attack on Nimrod is kind of eerie in hindsight, since he was killed during the Second Coming event trying the same trick on Bastion, who was a fusion of Nimrod and Master Mold. Was he trying the same trick? I thought he was teleporting himself between Bastion and Hope and (purposefully) ended up materializing around Bastion's arm. I could be misremembering that, though. Either way, it is a bit eerie in hindsight. Something I hadn't thought of before. I was surprised how closely PCR hewed to JRJr. 's style, especially since he's credited as finisher and not just inker. The only stuff that really reminds me of his work are the fantastic Body Shoppe environs. Leland's scattered thought balloon on Pg. 2 is quite Claremontastic — it reads like an entire crowd scene's worth of overheard thoughts. Kitty "swimming" underground to get Peter doesn't quite compute to me. The only way she can propel herself forward is by getting traction, which shouldn't be possible if she's phased. Maybe she can move herself forward through sheer will power, like some low-level (and multidirectional) form of levitation, which better explains her walking on air, too, but in that case she shouldn't need to literally go through the motions of pretending to swim; she could just propel her phased form forwards. Then again, I have no idea how Peter is supposed to hold his breath for any length of time while he's unconscious. A great issue all around. PCR does a great job on the finishing. It's a very nice looking issue. And yeah, at least Leland goes out on a high note. The more I reread these issues via your blog, the more I wonder how different things would have been had CC been allowed to go ahead with his original plans for the Mutant Massacre/Fall of the Mutants. Almost as a big a "What if...?" as "What if Claremont stayed on uncanny until #300?"